Broken ankle recovery takes time and patience, and it involves a few important steps. The length of time will vary depending on the severity of the break, as will the treatment process. A broken ankle is not a life-threatening injury, but the pain can be excruciating. Thankfully, once the bone is set the pain lessens to a dull ache and the path to broken ankle recovery begins quickly. The first step in treating and recovering from a broken ankle is to x-ray the break. Most of the time broken ankles are treated in the emergency room, because this type of injury is usually an accident and requires immediate attention. The purpose of the x-ray is to get an idea of what the actual broken bone looks like and how badly the bones have been displaced from their natural position. Once the doctor reviews the x-ray, they will determine how to proceed with treating the broken ankle. Swelling is almost always present and severe with any broken bone. There are two vital actions required to treat the swelling that accompanies a broken ankle: keeping ice on the area and elevating the leg. The ice should be applied as soon as possible in order to reduce the swelling and keep it to a minimum. Putting the ankle up also helps reduce the swelling because it stops the blood from rushing down into the lower leg. Broken bones are generally set and put in a cast to heal, but it is quite common for the emergency room doctor to put a broken ankle in a splint for a few days before the more permanent cast is put in place. A splint is used in the initial treatment of a broken ankle because the ankle is usually very swollen, and this can interfere with the cast and cause unnecessary discomfort in the first few days of broken ankle recovery. 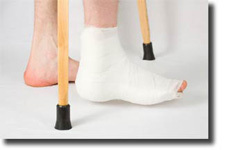 Depending on the type of break, the broken ankle bones may need to be reset before the cast or splint is put in place. If the bones are dramatically displaced, the doctor will have to rearrange them until they are back in the correct position and aligned properly. This process can be extremely painful, but it is important for both healing the broken bone and preventing future problems with the broken ankle. If the broken bones do not correctly fuse back together, this could cause arthritis and chronic pain as time goes on. Once the break in the ankle is correctly positioned, the splint will be put on to keep the ankle in place as it embarks on the journey to recovery. The splint allows more space for the swollen ankle and works fine initially. After a few days, the splint will be taken off of the broken ankle and a cast will be put in place for the long-term healing to continue. The purpose of putting a broken bone in a cast is to keep the bones in place while they repair themselves. The cast fits fairly tightly around the ankle area and restricts the ankle movement. This is needed for proper recovery and to protect the ankle from further damage while it is healing. A cast can be made out of plaster or fiberglass and even comes in different colors for the fashion conscious. A plaster cast can be pretty heavy and uncomfortable, but it beats walking around on a broken bone. Fiberglass casts are used when the break is not as severe, because they are lighter and do not provide as much stability as a plaster cast.